FRANKFURT: The European Central Bank, spooked by soaring prices for food and fuel, raised interest rates Thursday, joining several other central banks in battling a global eruption of inflation. The quarter-point hike, which the bank had signaled last month, had little initial effect on markets, with the euro treading water against the dollar and stocks staying relatively steady. Central banks in Sweden and Norway also raised rates this week, citing inflation. On Thursday, Indonesia raised its key interest rate for the third time this year, while India raised its key lending rate twice last month. The Federal Reserve in the United States, where short-term interest rates are only half of those in Europe, has so far declined to join them. The European Central Bank’s decision deepens a recent divergence in monetary policy across the Atlantic, ending a long period when it tended to follow the course set by the Fed. But the sharp rise in inflation has put Europe’s bank into a policy bind because it has been accompanied, in recent days, by evidence that the economy here is deteriorating much like that of the United States. Manufacturing activity in the 15 countries that use the euro shrank in June for the first time in three years, according to a survey of European purchasing managers. In Spain and Ireland, where a collapse in housing prices has magnified the problems, there is a real risk of recession. Still, the European Central Bank, hewing to its inflation-fighting mandate, pressed on with the expected increase, moving the benchmark rate to 4.25 percent from 4 percent. Among other things, it is intended as a warning to unions not to use higher inflation as a lever to demand hefty wage increases. Say goodbye to the Dollar and to Wall Street. It was not clear, before an afternoon news conference chaired by the bank’s president, Jean-Claude Trichet, whether the rate increase would be a one-time gesture or the start of a cycle of tighter monetary policy. Several economists said they doubted the bank could tighten much further, given the parlous economic situation. Indeed, the bank has come under intense political pressure in recent days not to tighten credit at such a fragile moment for Europe’s economy. The French president, Nicolas Sarkozy, said higher rates would do little to stem the rising price of oil. The German finance minister, Peer Steinbrück, warned that an increase could further depress growth. The central bank, under Trichet, has steadfastly rebuffed efforts to influence its policy. But even within its 21-member governing council, the unhealthy combination of inflation and stagnation has opened a split – with inflation hawks calling for a rate increase, while the doves resisted it. The hawks are led by Axel Weber, the president of the Bundesbank, which bequeathed its long tradition of inflation fighting to the European Central Bank. Germany is also an exception among major European countries, in that its economy is still expanding, even if more modestly lately. 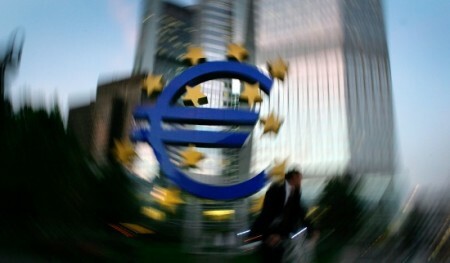 The position of the hawks was reinforced Monday with new statistics that showed inflation in Europe rose to an annual rate of 4 percent in June, twice the ceiling set by the European Central Bank. With oil prices continuing to surge – it traded at a new record of $145 a barrel in Asia on Thursday – some economists expect inflation to spike even higher in August, perhaps to 4.25 percent. In raising rates, even at a time of such uncertainty, the European Central Bank has opted for the latter.